When daylight saving time ends Sunday, November 2, don’t forget to turn your clocks back an hour – and brighten up your wardrobe so you increase your visibility to stay safe. With the time change comes a darker evening commute and whether you head to work before daylight or head home after it’s dark – or both – TriMet wants you to be seen and be safe. We are teaming up with community partners to encourage bus riders, walkers and cyclists to increase visibility during low-light hours with reflective gear and safety lights. Be Seen. Be safe street teams will be out at busy transit centers and other key locations throughout the region during the week of November 3. 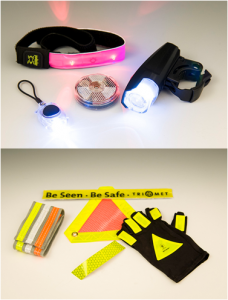 They will be handing out safety lights and reflective stickers while encouraging people to brighten up their attire during the darker fall and winter months. Our street teams have grown this year as many want to join TriMet in encouraging others to be safe. The teams will be made up of members from TriMet, Oregon Department of Transportation (ODOT) – Region I, Washington County Land Use and Transportation Department, City of Portland Bureau of Transportation, City of Gresham, City of Tigard, City of Forest Grove, City of Milwaukie, SMART Transit, Portland State University, Portland Community College, Hillsboro School District, Rex Putman High School, Clackamas County Youth Councilors, Clack County Safe Communities, Les Femmes Prospective Debutantes youth group, OHSU, Tualatin Valley Fire & Rescue, AAA Oregon/Idaho, Elders in Action, Westside Transportation Alliance, Washington Park Transportation Management Association, Swan Island Transportation Management Association, Go Lloyd, Go Lloyd Pedestrian Committee, Bicycle Transportation Alliance, Hayhurst Neighborhood Association and Holladay Park rangers. The entire effort is sponsored by Drive Less/Save More, ODOT and KGW. 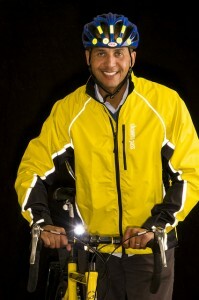 Wear bright clothing and accessories with reflective material such as coats, scarves, hats, gloves, shoes and backpacks. Throw on a reflective safety vest or sash over your coat. You can find them at construction, outdoor, sports and bike stores. Add reflective tape, strips and stickers to shoes, backpacks, bags, coat sleeves, pant legs, bicycle frames and spokes and bike helmets. Slap a reflective band on your arm, leg or ankle. These show 360° movement, which can be seen from all angles and is more likely to attract the attention from drivers. Use lights freely, whether on a bike or flashing blinky lights attached to clothing or bags. Many products, such as armbands, hats and vests, come with lights in them. For more safety tips go to trimet.org/beseen. In the dark morning and evening hours, it can be difficult for bus operators to spot riders at some stops. To help them see you, wave a reflector, wear a safety blinky light, have a small flashlight or use your cell phone display to alert the operator as a bus approaches. Some mobile devices and mobile apps including the free TriMet Tickets app, have a strobe or light feature for this purpose. Please do not shine flashlights or bright lights in operators’ eyes. It can also be helpful to wave as the bus approaches. TriMet’s Night Stop program also aims to help bus riders stay safe during the darker months. It allows operators to drop riders off along the route between bus stops – if it’s safe to do so. Between 8 p.m and 5 a.m. Ask a block or two ahead of the destination to be let off at a non-designated stop location. Operator determines if there is safe spot to deboard. If not safe, request will be denied. If bus turns left in same block as requested stop, drop-off will be after turn is made.